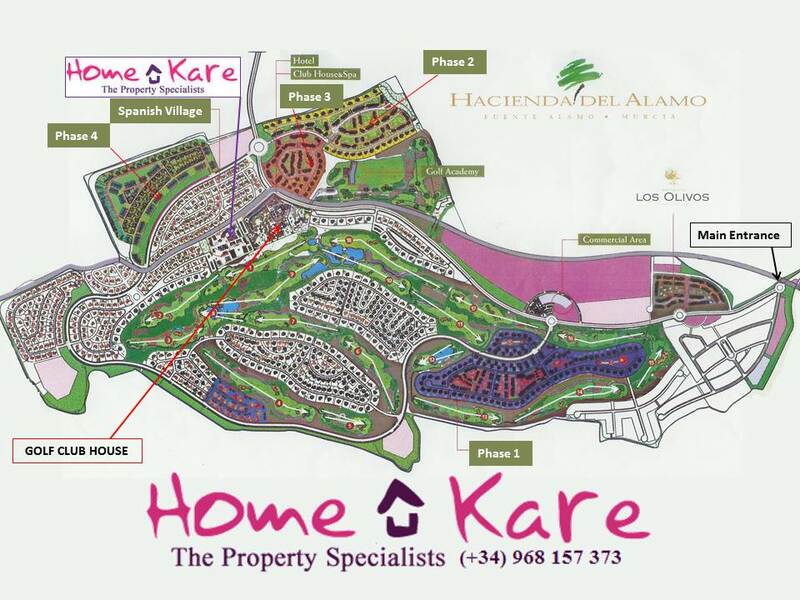 A recent announcement by Sareb Bank of an invest of around 6 million Euros in Hacienda del Alamo will surely see the property prices at Hacienda del Alamo increase over the coming months. Hotel is due to open 2 quarter of 2018 with an improvement of the infrastructure within the Resort imminent. Centered on a manageable sized plot here at Hacienda del Alamo in a much sort after corner location. Beautifully landscaped plot, low maintenance using an abundance of sub-tropical trees and shrubs to create an oasis within an oasis, large private swimming pool with excellent privacy and a multitude of areas offering as much sunshine or shade that you could desire. Recent additiona of a woodern pergola, right next to the builtin BBQ, an ideal spot for a long evening meal. The combined lounge and dining area with feature ceilings are a center point to the property, a fully fitted kitchen is showcased in the dining area with an open 'show kitchen' type breakfast bar. Full range of kitchen units and appliance's with granite work surfaces, a very usable space whilst entertaining or looking after the family. All of the accommodation is on one level, the Master bedroom suite boasts a private en-suite shower room whilst bedrooms 2 and 3 share a family bathroom. Access to the beautiful covered terrace via the dining area or kitchen doors naturally extends the living area, the open views extend over the pool and garden, ideal for sunny lunches in the shade! The Vega style villa has an internal courtyard with external stairs leading up to another covered terrace. The nearest bar and restaurant is just a short, 10 minute stroll away. A popular choice of house style for many here at Hacienda del Alamo, this Vega with an official constructed area of 143sqm feels much bigger as the Southerly orientation allows the light to enter the villa on several levels, whilst the outside space offers the possibility of bringing outside in! From the galley stye kitchen, glass panel door to covered drying area, with direct access to the large garage with tiled floors and up and over, remote controlled garage door, just perfect for additional storage or parking a car out of the Spanish sunshine!